In this easy magic trick, you cause a coin to somehow pass through the top of a table. To perform this trick, you’ll need to be able to execute a vanish called the "French Drop," which we teach in another lesson. A good follow-up to this trick is the coin vanish. This way, you can cause the coin to pass through the table and then vanish it completely. This one is probably best if you are seated at a table, although you can be standing. For purposes of this lesson, we'll assume that you will be pushing the coin through the table top with your right hand to your left hand. If you want to use your left hand instead, simply reverse the instructions. 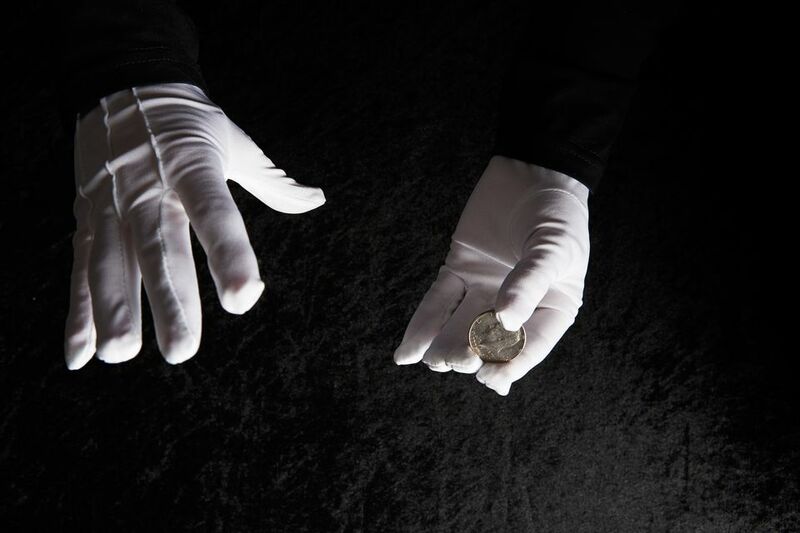 Hold the coin in your left hand between the fingers and thumb as shown in the picture. Execute the French Drop move. Click here to learn the move. You’ll be retaining the coin in your left hand and spectators will think that you have taken the coin with your right hand. With your right hand in a fist, pretend that it is holding the coin and move it forward towards the center of the table. Meanwhile, your left hand quietly retains the coin and moves to the edge of the table and underneath. To direct the attention of spectators towards your right hand, you can knock on the table as if you are looking for a soft spot in the table. If you like you can even state that you are doing so. Slam your empty right hand down onto the table top. To make this more convincing, you can tap the coin that's held in your left hand up against the bottom of the table top at the same time. This way, spectators will hear the sound of a coin hitting the table and seemingly passing through its surface. Show your right hand empty. Bring out your left hand from underneath the table with the coin.